PETOSKY, Mich. -- Still just a baby at three years old, the Bay Harbor Golf Club has already built up a legendary lore worthy of the nation’s best courses. Just being the crown jewel of Boyne USA’s 172-hole golf empire is pretty impressive, but this 27-hole golfing paradise is much more than that. 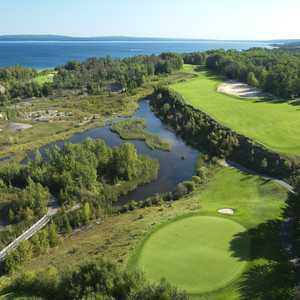 Golf Digest has called the semi-private Bay Harbor the King of northern Michigan, which is a collection of some of the nation’s best golf courses and a golfer’s vacation heaven. Golf Magazine has called the course the “Pebble Beach of the Midwest” because of its grand vistas along the beautiful Lake Michigan and the Little Traverse Bay. 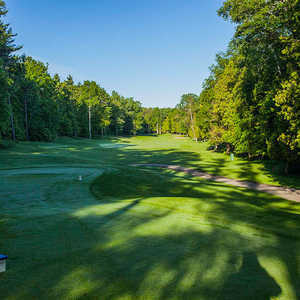 Toledo-based architect Arthur Hills cut the course through the natural settings along the bluffs of the lake’s shoreline, through a rock quarry and finally through the pristine forest of northern Michigan to create three distinctly differing nines – the Links, the Quarry and the Preserve. Although he’s also designed other great courses, Bay Harbor, which opened to much fanfare in 1998, is considered Hills’ crowning achievement. Because of its private membership, Bay Harbor’s service and amenities are unparalleled. The practice facility is first rate with several rows of hitting stations and several putting greens. The stone and stucco clubhouse features a cozy pro shop and excellent food at Arthur’s Restaurant. And its huge patio overlooks the lake. But as good as everything else is, nothing beats a round of golf here. The question everybody always asks is: it worth the money ($240) to play? Most would shout “Yes,” even though Bay Harbor is possibly the most expensive round of golf in the Midwest. You don’t have to be a par-shooter to enjoy the natural beauty. It’s truly a golf experience of a lifetime. 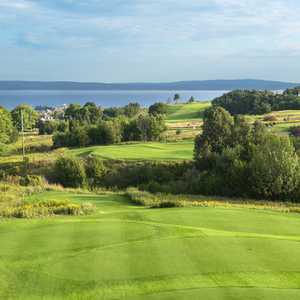 THE LINKS: This 3,432-yard nine never ventures too far from Lake Michigan and Little Traverse Bay, giving golfers some panoramic scenery they’ll cherish. As the name suggests, the links were fashioned after windswept shorelines of Scottish links golf. Huge fairways are lined with viciously long heather-grasses (or gorse). Although not pot bunkers, the greenside sand traps can be deep and unforgiving. The 425-yard first hole runs along the shoreline, but the real views start at the elevated tee of No. 2, a downhill 437-yard par-4. Soaking up the scenery is a must on tees of No. 3, a 380-yard par-4, and No. 4, a 178-yard par-3, but so is some excellent shot-making. On No. 3, players must decide between taking a short cut to the proper fairway, which demands a 225-yard carry, or layup to the fairway on the top-shelf for a longer, tougher approach over a huge bunker to an elevated green. No. 4 is a Kodak moment if there ever was one, as the tee plummets some 40-50 feet to a skinny green and two bunkers below. Some players don’t like the controversial fifth hole with its blind tee shot. After navigating a narrow shoot between woods on the left and a mounding of natural waste area of brush and sand on the right, the hole doglegs hard right to a tiny elevated green. The gorgeous 500-yard seventh is the closest thing to Pebble Beach this side of the Rocky Mountains. The fairway slithers back and forth along Lake Michigan, sitting on cliffs 150 feet above the water. The two-tier green rubs gently against the cliffs, meaning anything long or right goes bye-bye! After another breath-taking downhill tee shot into the 225-yard eighth, the course gets a bad attitude with the 518-yard ninth hole. Wetlands run the length of the right side, enforcing a 200-yard carry off the tee from the blues. Not even the lay up is easy as the swamp juts out into the fairway. The green is invisible behind another of Hills’ mountain-like fairway mounds. THE QUARRY: This nine, easily the toughest of the three, was showcased on national television in Shell’s Wonderful World of Golf special between Phil Mickelson and Tom Lehman. This 3,348-yard gem was cut through a former shale quarry. The 40-foot rock walls are an incredible sight next to the lush green fairways. But beware of the beauty – you can lose a ball at any turn. Eight tee shots and six of the nine approach shots require forced carries, some of considerable length from the blue tees. No. 1, a 353-yard par-4, could be a birdie hole, providing your tee shot carries the swamp off the tee and stays short of the wetlands near the green. A large waste bunker lurks left of the green. Instead of bunkers on No. 2, a 202-yard par-3, Hills designed tricky collection zones around the greens as hazards. Players must choose between a tough putt and an even nastier chip. No. 3, a dynamic 561-yard par-5, introduces the quarry along the right side. A large waste area on the left will catch feeble layup attempts. The approach must carry the quarry to a green below. The views from the fairway are nothing short of stunning with Lake Michigan in the distance and the rest of the course laid out below. The next par-5, the 495-yard fifth, is just as good. The prevailing winds usually make it easy to carry the pond off the tee, but most will lay up on their second shot, short of the water guarding the green, which sits in the shadows of a 40-foot rock wall and its natural waterfall. Don’t let the whimpy yardage at the 332-yard sixth fool you. If the tee shot to a skinny landing zone isn’t precise, the second shot to a peninsula green surrounded by wetlands will be doubly difficult. As if the 190-yard carry from the blue tees wasn’t enough on the par-4 406-yard seventh, Hills put a bunker smack dab in the middle of the fairway. The glorious eighth might be the prettiest hole on the course, playing 172 yards downhill to a peninsula green, surrounded by Lake Michigan. Running along the cliffs above the lake on the left, the ninth hole looks innocent from the tee, but the fairway plummets roughly 30-40 feet to the green at the 120-yard mark. With that dramatic conclusion, this could easily be one of the best nine hole stretches in the country. THE PRESERVE: Although considered the weakest of the three nines, that’s really not true. There are no weaknesses at Bay Harbor. The Preserve is a more traditional, northern-Michigan layout cut through the woods. It doesn’t have the stunning views of the lake of the Links nine or the beautiful rock formations of the Quarry, but it is still grand golf with immaculate playing conditions. The nine has a great combination of long and short par-4s. To combat the generally flat land, Hills incorporated mounds guarding the front of the fairways on No. 1, a 391 par-4, and No. 3, a 423-yard par-4, to force players to confront their fears of blind shots. The seventh green, which is a double green with No. 2, is also guarded in front by a huge mound. This might be the only questionable gimmick in Hills’ layout. Bay Harbor touts this seventh fairway as possibly “one of the largest” in golf because it combines with another large chunk of fairway from No. 3. The nine’s best hole might be No. 2, a thrilling 341-yard par-4 that demands two carries over swamp. The toughest is unquestionably No. 4, a brutal 577-yard par-5. Players must choose sides of the split fairway and then manage a swamp in their approach to the green. The finishing hole captures all the thrills of Bay Harbor with a downhill 186-yard par-3 with Lake Michigan in the backdrop. THE INN AT BAY HARBOR: What could possibly be more luxurious than the golf course? Well, the Inn at Bay Harbor might just take that honor. The Inn, a five-star vacation land, is the headquarters of Bay Harbor Village, overlooking Little Traverse Bay. It is home to 85 one- , two- and three-bedroom suites, the Bay Harbor Beach Club, the Spa at the Inn, conference facilities for up to 200 people, and Sagamore’s, a lakefront restaurant. The Inn, a member of Preferred Hotels and Resorts, is built in a grand Victorian theme. Staying here isn’t close to cheap by any means, but it will knock about $60 off your tee time at the golf course.